6th. Year pupils showed great enthusiasm in making pompons for Punta Chica Kinder. Guillermo, our gym teacher, uses them during his lessons and we find this a very good occasion for our "big pupils" to think of the "little ones". 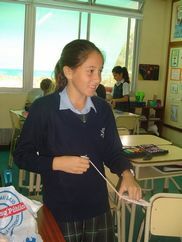 This has been another way of developing, in our pupils, a sense of responsibility and care towards other people´s needs. -We love making pompons for kinder. A good opportunity to get to know more about their friends.